I am in Walsingham and missed the Mass at noon where Bishop Davies gave this homily. However, here is the text from the website. We gather during this celebration of Her Majesty Queen Elizabeth II’s Diamond Jubilee. We rejoice with many today not only in the Queen’s constitutional role carried out with unfailing dedication but also in her Christian witness of faith and prayer. However, it is significant that a family stands always at the centre of our constitution, at the heart of our national life. The Crown passes by way of a family! It was, of course, in this Norfolk countryside almost a millennium ago that a simple house was built to remind all generations of the centrality and holiness of the family revealed by God’s plan in the Holy Family of Nazareth. True, it was a monarch, King Henry VIII, not noted for his reverence for marriage, who saw both house and shrine destroyed four centuries ago. Yet Walsingham has now visibly returned in its Catholic and Anglican witness. Here we will always be reminded in Blessed John Paul II’s unforgettable words that, “the future of humanity passes by way of the family” (Familaris Consortio n. 86). It is a self-evident truth which too often is obscured in our consciousness today that the future of humanity, the future of society, depends on the family. The Deputy Prime Minister was recently reported as saying he could not understand why Christians and other people of faith saw a legal redefinition of marriage as a matter of conscience: it would not he claimed impinge on religious freedoms. Experience, of course, might make us cautious of such assurances, even those given by a Deputy Prime Minister, that this agenda will not threaten religious freedom. However, our concern is not only with religious freedom but also with the enormous good which marriage represents as foundational to family-life. Today we see a government, without mandate, disposing of any credible consultation, seeking to impose one of the greatest acts of “social engineering” in our history by uprooting the legal definition of marriage. Marriage lies at the very foundation of the family. For all generations to follow one generation of politicians is setting out to demolish in the name of an “equality agenda” the understanding of marriage that has served as the timeless foundation for the family. The government is seeking to do this at the very moment when marriage as an institution has been more weakened than ever before. Yet it asks: why are people of faith concerned? One of England’s greatest and clearest thinkers the now Blessed John Henry Newman famously distinguished what he called “notional assent” from “real assent.” It seems that most people in public life give a notional assent to the value of the family as that first and vital cell of society – and never more so than in those moments of social disturbance such as the riots of last summer. However, what is needed is not just a notional agreement to the importance of family but a real assent to the place of the family in our society as securing the well-being of generations to come. This involves the recognition of what marriage uniquely is. 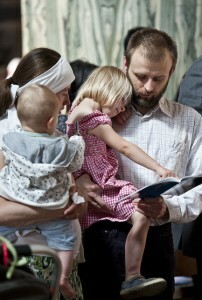 A recognition comes not only from faith but from reason which clearly sees that it is from the family that “citizens come to birth and it is with within the family that they find the first school of the social virtues which are the animating principle of the existence and development of society itself” (Familaris Consortio n 42). In this way it is in the family that the future of society will be decided. So far from weakening and confusing the foundation of the family we invite our political leaders to give back to the institution of marriage and the family the recognition and confidence it deserves. Here in Walsingham where across so many centuries of our history the sacredness of marriage and family were recognised in the example of the Holy Family of Nazareth, we wish to affirm in the words of Blessed John Paul II that “the Creator of all things has established marriage as the beginning and basis of human society” (Familaris Consortio 42)). May the gift of marriage and the family be held sacred by us all for the sake of every generation to come. This post is a bit later as usual as I was travelling and stupidly forgot that the Queen's Jubilee has created four days of limited train and virtually no bus services. However, I am in the north, in the Holy Shrine of Walsingham, which is the National Shrine of England. The town is a mixture today of Anglo-Catholics, Catholics and even some Presbyterian group which is against the procession and protestant services (I can't use the term Mass), which are happening. The protesters are pointing out that the Bible does not support the Eucharist, devotion to Mary, or all the lovely statues here. Well, if Presbyterians look at Tradition seriously, they would not be Presbyterians. The police are out in force, which is a really odd thing to see in Walshingham. I am not worried about the Presbyterians getting violent, although they are very zealous. Christianity comes and goes, flowing in and out of Walsingham, the shrine which even Henry could not completely destroy despite the martyrs, whose blood was shed here. Every Catholic, at least once in his or her lifetime, should visit Walsingham. I was here last year as well. The Anglican shrine sadly causes some confusion, as Catholics go there thinking it is the Catholic shrine, which is out on the outskirts. The Anglican shrine even has so-called holy water. 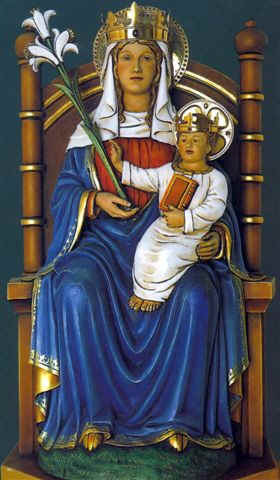 What is most wonderful to me is that the Ordinariate in England is dedicated to Our Lady of Walsingham. I am making this little pilgrimage for all my Ordinariate friends, my son, the priests who are on my prayer list. and for your, dear readers. May God bless you all. I just finished the Consecration to Mary of St. Louis de Montfort again. Pray I can get to Confession. It is not as easy as one would like in Walsingham.